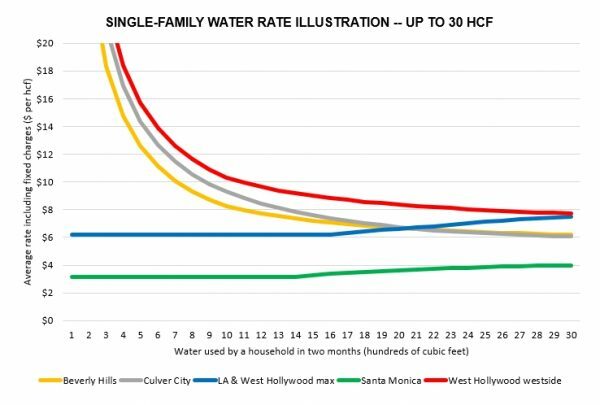 Water rates are often higher for West Hollywood customers who get their water from Beverly Hills than for those who get it from Los Angeles. In those cases, the rates are also the highest among nearby cities. On the other hand, West Hollywood customers served by Los Angeles often have the second-lowest rates in the area. That is according to a new report by WeHo by the Numbers. The report begins by explaining how water rates are structured. Water rates are based on the cost of service. When providers set their rates, they add up the costs and split them among customer classes, services, and levels of water use. Water use is typically measured in hundreds of cubic feet (HCF). One HCF is 748 gallons. For example, Beverly Hills has rates for single-family residential, multi-family residential and non-residential (commercial) customers. The bi-monthly bill includes fixed and variable charges. The fixed charge is based on the size of the water meter. Customers expecting to use a lot of water — such as a large apartment building — install bigger meters. The variable charge is based on water consumption. For single-family and multi-family customers, the water comes in four tiers. Once they’ve used up a tier, they start buying water from the next, higher-priced tier. Some cities charge higher rates to customers outside their boundaries. Beverly Hills adds a 25% premium for West Hollywood customers. Los Angeles does not currently charge West Hollywood customers extra. The number, size and pricing of tiers varies among cities and customer classes. So does the fixed bi-monthly charge. Some cities, such as Los Angeles and Santa Monica, do not have a fixed charge. Instead, they recover those costs through the variable charges for water use. The report shows estimates of the average rate for each level of water use, customer type, and city. Fixed charges are included and some assumptions are made. The analysis focuses on a range of water use centered around 15 HCF. It reflects the smaller households and lot sizes in West Hollywood. For West Hollywood single-family customers, the report suggests that those served by Beverly Hills often pay more for a given amount of water than those served by Los Angeles. The difference is close to 50% at 15 HCF. The difference is even bigger for customers who use less than 15 HCF. The Beverly Hills-served customers also pay more than customers in nearby cities. For 15 HCF, they pay 18% more than in Culver City, 25% more than in Beverly Hills, 45% more than in Los Angeles, and close to three times as much as in Santa Monica. On the other hand, many West Hollywood customers served by Los Angeles pay less than they would in Beverly Hills or Culver City. It depends on how much water they use. Santa Monica, however, has even lower rates. Its rates are about half of those of Los Angeles at these levels of consumption. The single-family rate comparison looks different at consumption levels above 30 HCF. The report argues that those levels are less common in West Hollywood. 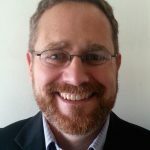 For average multi-family rates, the number of dwelling units matters. The report offers two illustrations: a four-unit property and a 100-unit apartment or condominium building. The report suggests that small Beverly Hills-served properties in West Hollywood generally pay more than those served by Los Angeles (for a given amount of water). For example, the difference could be 20% at 10 HCF. They also pay 20% to 75% more than customers in nearby cities who use the same amount of water. For large multi-family buildings in West Hollywood, the Los Angeles and Beverly Hills rates appear to be fairly close. The differences depend on the amount of water used and other assumptions. At something less than 10 or 12 HCF per household, Los Angeles-served rates may be a bit higher than Beverly Hills-served rates. Above that level, Beverly Hills-served rates may be higher. Businesses, nonprofits and government agencies pay non-residential rates. Their water consumption varies widely. 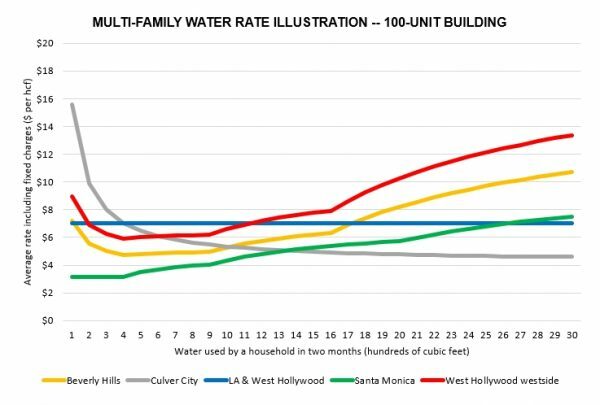 The report found that Beverly Hills-served West Hollywood generally had the highest non-residential rates among nearby cities for a given amount of water. 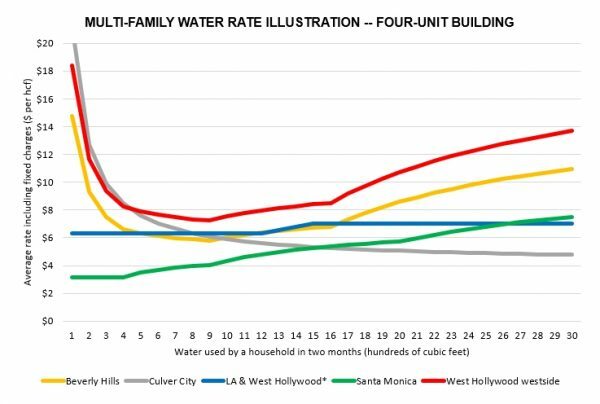 For more information, see the full report, How do water rates in West Hollywood compare? Thanks Lauren for addressing this issue. I hope she fights for us and gets those extra fees removed from all of our water bills. Without Lauren Meister’s diligence on this WHWest would be drowning in exhorbitant water bills. Another “quality of life issue”that passes unnoticed by other council members.